Begin by speaking to Grish located west of Ogre City and south of Castle Wars. First, speak to Grish (located South of the Castle Wars Arena), and he will give you some Cooked Chompies and Super Restore Potions and speak of some underground place. Speak to the guard to the east and he will crush the barricades for you. Pass over them and and enter the dungeon to the east. Now head to the far northwest until you find a charred area with some Coffins nearby. Search the Skeleton and a level 52 Zombie will appear; kill it and pick up the Ruined Backpack. Open it to find that it belonged to B.Vahn, and it has some Rotten Food, a Knife, and a Dragon Tankard inside. It will then rip. Now search the broken Lectern near the Skeleton to find a Half Torn Page . First,search the Ogre Coffin located directly west of the Skeleton, and then use your Knife on it. After that, use your Strength to try and lift the lid (can be failed at the expense of your strength), and you'll receive a Black Prism. Note: While in the tomb, you'll be affected by an orange Poison Indicator. It's a disease that only reduces your stats and can be cured by Relicym's Balm (below). Go the inn located in Yanille, use the Dragon Tankard on the Barkeeper and speak with him. He will speak of Brentle Vahn, a common customer, as well as a wizard. Head to the front of the Magic Guild and speak to Zavistic Rarve (ring the bell if he isn't there). He speaks about the dark arts. 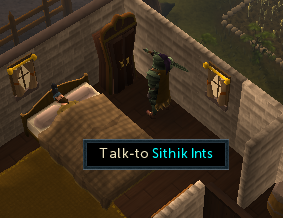 Head to Sithik Ints' room upstairs in the building north of the guild. Talk to him (he is in bed and does not appear in the minimap) and search around in the room to find a HAM Book, Portraiture Book and a Necromancy Book. You should also find some Charcoal and Papyrus. Read all 3 books; the Torn Page fits in the Necromancy Book. Use each of the books on Sithik, and then use a piece of Papyrus on him to make a sketch. Show it to him and then bring it to the Bartender so that he gives you a Signed Portrait. Your first sketch may not be a Good Sketch, so just make another sketch of Sithik if it isn't good enough. Bring the Signed Portrait to Zavistic, who will give you a Strange Potion to give to Sithik. He refuses to take the potion directly, so instead use it on the Cup of Tea found on the Drawers beside his bed. Head downstairs, then back upstairs to find that he has become an Ogre! Talk to him about each of the different options. He'll tell you about making Brutal Arrows, and a Poison Cure for the Orange Curse. First, get to Karamja either by teleporting or by boat. Find the 2 herbs: Rogues Purse and Snake Weed (from the Jungle Potion Quest). Add the Rogues Purse to a Vial of Water first, and then add the Snake Weed to get Relicym's Balm, which cures disease. You can also make an extra potion for Uglug Nar to buy, and he will let you use his shop! Now talk to Grish about each of the different options, and he will show you how to make a Composite Ogre Bow and he will give you an Ogre Gate Key. To make a bow, use a Knife on some Achey Logs while carrying Wolf Bones, and then add a Bow String. To make Brutal Arrows, cut Achey Logs into Shafts, add feathers, and then add nails of the desired metal to the Unflighted Shafts. Brutal Arrows are very effective against Zogres, and you need to speak to Sithik before being able to make them. Now get anything you'll need for the fight, including food, armor and potions. Once you have everything, head back to the tomb, head west past the 2 big stone doors and down the stairs. Go north, then east, and search the stand and a level 84 Slash Bash will attack you. 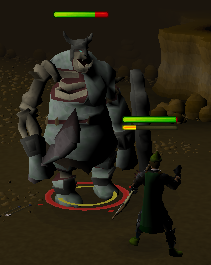 Use your Protect From Melee Prayer if you can (be careful, he also uses a weak Ranged attack and can drain Prayer quickly). The Brutal arrows are particularly effective against him, as normal weaponry is practically ineffective against him. 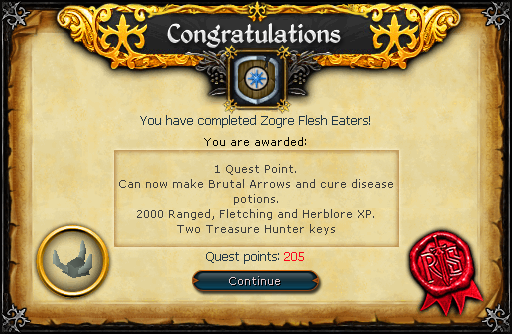 Use Brutal Arrows against any Zogres that you may fight in the future! Kill Slash Bash and pick up the Ogre Artifact and bones. Go back to Grish to receive your reward. Quest complete! You can bring the Black Prism to Zavistic for a reward of 2,000gp or Yanni Salika in Shilo Village for a reward of 5,000gp.